"Reads like the birth of a brand new genre...an audatious, ambitious debut." Joseph Bates, author of Tomorrowland: Stories. A wickedly smart, deceptively powerful novel about the uneasy intersection of love and commerce. Winner of the Fiction Attic Press Debut Novel Prize. When Laura hires herself out as a human breast pump, she is unprepared for the devotion she inspires in new moms desperate to be relieved of the machinery of lactation. Soon, the situation at her job goes sour, and she devises a plan to work less and earn more. A dreamer at best and a steam-roller at worst, Laurie hopes to prove to the world that there is employment beyond the nine to five. Her imaginative scheme draws a young housekeeper, a male bachelorette party babysitter, and a data entry clerk into the business of manufactured intimacy--a business more dangerous than Laurie is willing to admit. 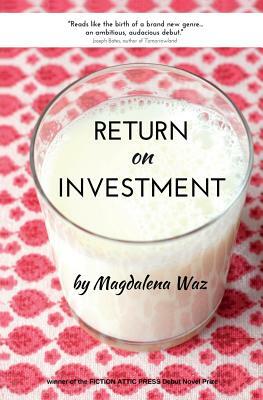 Sharp, darkly funny, and insightful, RETURN ON INVESTMENT will appeal to fans of Maria Semple, Jess Walter, Jami Attenberg, and Lena Dunham. A must-read for anyone who knows what it means to seek fulfillment through work and love.